The nature always has something to share with us and there is definitely no limit of the natural beauty for us to see. No matter how many pictures we take but the nature still becomes the reason of taking more and more pictures. The beauty of the nature will never stop surprising us. Tawang is one such hill station. Arunachal Pradesh is mostly known for its natural beauty. It has great part in the touring and traveling industry because in Tawang, we find just so many places where people like to visit again and again. This is amazing place because its culture is filled with lots and lots of history. Its past is colored with so many colors of different aspects. Mainly, in Tawang, we find the majority of Monpa people because they inhebited here From 500 BC to 600 AD. This place has a really very astonishing and surprising history. There is no lack of any subject in the history of this place. If you like adventure then you will find so many things that will grow your interst make you know more and more about this place. A really very interesting fact about this place is that it is also the very place where Dalai Lama visited on 8th November of 2009. This is also another factor that gave a strong historical value to this place. Generally, this place is the most peaceful place for relaxation because the air is so fresh and everything is just perfect for a perfect relaxation time but that does not mean that this place unsuitable for party lovers. If you like to see some excitement in this place then you should see the celebrations of festivals in this palce. There are many festivals which are held annually, some festivals are held in every few years. The festivals Losar, Choskar, and Torgya are highly remarkable and you should not miss them if you are visiting this place. If you have ever been to the scotland then you can exact picture of the Scotland’s Lewis and Harris area in this place because this place carry the similar size of area and you will not find it any less in the beauty and grace as well. If you have not seen snow fall for real then this is the chance for you to see the actual snow fall because here at this place, in the winter season, you will get a chance to see and experience the pleasure of heavy snowfall. In other seasons, the weather stays pleasant and you can enjoy fresh and relaxing wind of about 13°C. Tawang have always been one step ahead in all kinds of beauty. It is significant that this place has a rich history but it is also interesting about this place that Tawang also carry amazing attraction of architectural and natural beauty. Sela Pass: This is one of the most appreciated touring destination in the entire Arunachal Pradesh because it is covered with the mountain and it gives the picture of amazing and eye catching natural beauty that is hard to find. Tawang Monastery: This is the significant proof of the architectural beauty of this place. 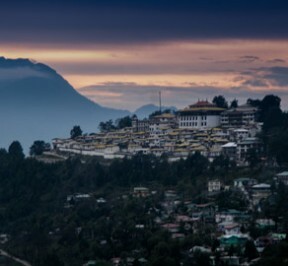 Aslo it is the second largest monastery in the entire asia and has the title of largest monastery of Tawang. Taktsang Gompa: It has great historical value because this place was honored by the visit of Guru Padmasambhava in the 8th You will also see the magica of natural beauty sprinkled in the air of this place. Gorichen Peak: This is the place filled with so many mountains but Gorichen Peak is not the ordinary peak. It is perfect for the people who look for the adventure of natural sports. This is perfect place for trekkers. Shonga-tser Lake: Also called Madhuri Lake. It was formed due to the occurance of earthquake in the year 1971. Here you will find snow capped mountains everywhere with spectacular views. Nuranang Waterfalls: You can also call it wonder of this place. This is a 100 meter-high waterfall of Tawang and you will definatley cal it one of the best natural wonders of this place. Pankang Teng Tso Lake: This lake stays frozen in the winter time so it is used for lake skiing in the winter time and it is famous for its sports. Bumla Pass: This is really very high location and at the higher position, you will find the lack of oxygen. Also the chillness of the snow is definatley too hard to bear but its beauty is best seen in this weather. This place becomes the treasure of natural beauty from May to October month. Tawang is best connected with Tezpur which is a major city of Assam. The best way to reach Tawang is to take flight to Guwahati and then travel by private cab.